What is the best cephalopod? And, if it isn't the same, what is your favorite cephalopod? Also: what is the worst cephalopod? 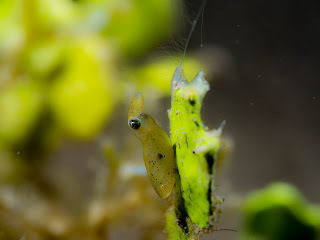 REVIEW: This adorable genus contains seven known species, all of which glue themselves to seagrass or seaweed with a mysterious and magnificent mucus. According to Mark Norman's Cephalopods: A World Guide, northern pygmy squid "feed on crustaceans . . . as large as themselves which they attack from behind and quickly eat into the heart." What's not to love? FUN FACT: Scientists are working on turning pygmy squid into a model organism--like white mice and fruit flies! REVIEW: Elusive as it is, this species completely slipped my mind at the bookstore the other night. But it was the subject of my first-ever cephalopod research project, back when I was an undergraduate in Santa Barbara, and as such it will always hold a special place in my heart. FUN FACT: Lilliput octopus eggs are enormous, up to one-third the length of an adult's body! LOCATION: California, natch, both Alta and Baja. Within that range, they like to hang out in giant kelp holdfasts. After picking apart dozens of holdfasts, I can tell you that 99.9% of the arms you think might belong to a Lilliput octopus will turn out to be part of a brittle star. REVIEW: Where do I even start? Named like a nightmare, these animals are in fact peaceful blue-eyed grazers. They defend themselves by inversion and, if that doesn't work, with a dazzling light show. They like to keep scientists guessing--despite the "squid" in their name, their anatomy reveals that they're more like a kind of octopus. And they're very patient parents. REVIEW: Come on, did you really think I'd name any living cephalopod? Nectocaris was initially thought to be a kind of shrimp, but a controversial 2010 Nature paper re-interpreted it as a squid-like creature, complete with tentacles and siphon. Current scientific consensus, from a review by Björn Kröger and colleagues: "Nectocaris is contrary to our understanding of cephalopod evolution . . . A more likely hypothesis is that Nectocaris . 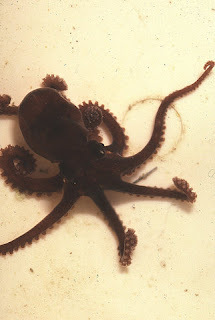 . . developed a mode of life remarkably similar to cephalopods." Evolutionary convergence at work. FUN FACT: Cephalopod paleontologists seem pretty tired of talking about Nectocaris, maybe don't bring it up--talk about ammonoids instead!